Does Your Vent Need It? If you're wondering how to tell, there are some easy signs to look out for! You may be able to see your vent, in which case you can simply check to see if it's blocked up, but sometimes that's not the case. Something else to look for is it taking longer for your clothes to get dry. It's more difficult for the air needed to dry them to get through the clogs, so it must run more. This can also cause it to heat up on the outside, so if it's hot to the touch, this is another indication. The factor to be most aware of, however, is if there's a burning smell present. If there is, you need to immediately shut the dryer down, because the lint is starting to singe and will become dangerous. It's best to wait until you get the vent checked out before using it again. Namely, for the sake of keeping your home safe! That burning lint that was mentioned can easily turn into a spark of fire if it isn't taken care of, making dirty vents a huge risk. Along with that, the longer run times to get your clothes dried means more energy use, and it can add up over time to make your bill far more expensive. If you've been trying to find ways to cut energy spending, this is a good step! We're Here To Fix It! There's no need to worry, as our experts can take care of it before you know it! We'll come over and get the vent completely cleared of lint and dust for you quickly and easily. We use high-quality tools to ensure that it will last you for a while. We also offer commercial services for hotels, apartments, and more! There's No Need To Wait! It's time to make sure that your home is safe and lower those energy costs too! 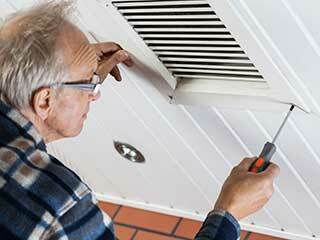 Just call Air Duct Cleaning Rancho Santa Fe now so we can get to work for you.